This is my first article in some time, though the topic is one I began researching several years ago. I examine common claims concerning the pervasiveness of land management practices among hunter-gatherer societies. It appears in Hunter/Gatherer, a student-run radical ecology journal. I’ve become frustrated in recent years with the lack of substantiation and pervasive confirmation bias in the popular media, so I chose with this paper to return to scholarly writing. This is the first in what may be a series of two or three articles on the topic of traditional land management. I was honored to receive from Gary Gripp his review of the article above. I’m not sure I truly lived up to all of Gary’s comments, but am gratified that, by his reading, I did manage to carry out the analysis with the intellectual honesty that should be a cornerstone of any scholarly writing. A second paper on the topic of TLM is progressing well. Much of the material was compiled sometime ago, but has required revision, updating, and reorganization. I will post another follow-up when it is closer to publication somewhere. My first full article in a year and a half, Agriculture: ending the world as we know it, is out today in the Canyon Country Zephyr. Published by Jim Stiles, The Zephyr, based in Southern Utah, has been taking independent, uncompromising stands on environmental matters for over twenty years. That makes it a good fit for this piece falling far outside the standard environmental thinking dominating the mainstream media. The article looks at the unsustainability of agriculture and, therefore, civilization. It examines the human break from nature in the origin of agriculture ten thousand years ago and where we are headed as a result. We cannot avoid tough times ahead, though we do have options available for softening the landing. Ultimately, we need to acknowledge the obvious but fundamental point that hunting and gathering is the only human way of life we know to be sustainable. That said, there will surely be a transitional period, post-civilization, when permaculture and related approaches to food production will be essential to many of those shifting toward true sustainability, even prior to a full move into hunting and gathering. Related to the note above, please also see the more recent notes following the previous post. Time for an update listing some simple, related points which underlie my thinking today. Civilization is inherently destructive and unsustainable. A key reason for this is that civilization is founded on agriculture. Agriculture circumvents the natural processes which regulated human population numbers prior to its inception. It is the basic ecological factor which has caused our numbers to overshoot carrying capacity so enormously. Along the way, agriculture destroys topsoil and ecosystems, tearing down the web of life, our global life support system. Agriculture is therefore unsustainable. Civilization will therefore come to an end. Because the human population is deeply into overshoot, we know that ending will involve a tremendous decline in our numbers. Converging issues such as oil depletion, climate change, topsoil and groundwater depletion, and the human-caused sixth mass extinction event in Earth's history suggest this may occur not many centuries from now, but sooner. How much sooner, no one can say. Though this signals the potential for tough times ahead, it also means an end to what's killing the earth. Immediate-return hunting and gathering (see below) is arguably the only human way of living proven ecologically sustainable. It thus makes great sense to study it to learn all we can. In light of the progressive destruction of Earth's life support systems, we see the reason for calls for a resistance movement from writers such as Zerzan and Jensen. Every day civilization remains intact brings more destruction of the web of life. Yet the potential for unintended consequences of such resistance actions presents a thorny dilemma to would-be advocates. An easier yet tremendously valuable option is to do what we can through established conservation measures to protect as much habitat and biodiversity as possible, helping to preserve those things for the future. One of the most important and ambitious conservation projects today involves "rewilding" by restoring, protecing, and connecting wildlands corridors containing large predators on a continental scale. That and other projects are represented in "organizations" page on this site. If you're interested in this topic, see the "core ecological issues" page for relevant links. For a fuller examination of these issues please see my more recent article, Agriculture: Ending the world as we know it. More recent updates appear below. When investigating hunter-gatherers, it's worth keeping a couple of things in mind. First, make sure you are looking at hunter-gatherers. I often see people, even prominent writers, attribute characteristics to hunter-gatherers only to find they are talking about some society which is actually agrarian or pastoral. 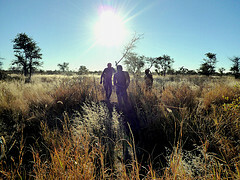 Second, it is crucial to understand the differences between "immediate-return" and "delayed-return" hunter-gatherers. As far as we know, the former term (roughly synonymous with "simple" hunter-gatherers) describes our ancestors' subsistence for the great bulk of human history. (See, e.g., Berman's Wandering God, 2000, p. 54; Kelly's The Foraging Spectrum, 2007, p. 304) Moreover, it's clear any debate on the matter becomes increasingly unreasonable as we work our way back through human existence. The first delayed-return societies may have begun to emerge during the Upper Paleolithic. Among these were also the first tribal societies, immediate-return societies having been composed of bands, not tribes. Immediate-return or 'generalized' hunter-gatherer societies are so unlike all others that, as Birdsell... once noted, it is difficult even for anthropologists who have not personally experienced one to conceive how they can exist; it is almost impossible for nonanthropologists to do so." Update on "traditional land management"
I've completed the first of two, perhaps three papers on "traditional land management" (AKA protoagriculture, low level food production, indigenous land management, etc.). Much of the material for the next two papers is completed. This has been a long process, immersing myself in the anthropological and ecological literatures, and relearning much about the scholarly writing process. I expect the first paper to be published fairly soon by a student-run radical ecology journal. I will post a link to it in the "Articles" section when it's available. These papers should provide useful reading for anyone wishing to go a large step beyond what I wrote above and in my article on agriculture. This is a photo (slightly cropped to fit) of the last band of aboriginal people in North America to fight and resist the takeover of their landbase by the United States government. 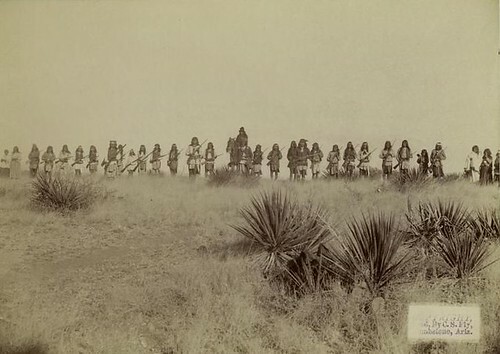 Numbering about 39 men, women, and children, this band of Apaches including Naiche, son of Cochise (on horseback) and Geronimo (standing in front of Naiche), evaded capture by a quarter of the US army and three thousand Mexican troops, finally turning themselves in, ending a key chapter in human history. The ending of lifeways apart from civilization among the aboriginal peoples of North America happened in about the same way it has happened worldwide. Central among proximate causes has been the growth of the population of those of us in civilization. The root cause has been civilization itself. Today as we puzzle over where we went wrong ecologically and socially, and scramble to find some way to fix things (prevented by those in power from taking meaningful action), we forget that for 3 million years we had many variations on a basic system which worked, made for fulfilling lives, and was sustainable. I expect to focus much more on this topic in future writing. For some insightful references see the section on core ecological issues and the relevant books in the book section. For an engaging source on the events surrounding the photo above, try David Roberts' Once They Moved Like the Wind. During much of their history, and certainly at the time of the photo, the Apache were not strictly hunter-gatherers. Owing to their roots, however, their surrender is an appropriate symbol for the loss of a way of life based not on agriculture, attuned to the natural world. While Geronimo's surrender marked the official end of the "Apache wars," reports suggest remnant bands of Apaches continued to live freely in the mountains of Mexico for years afterward. The period since the dawn of agriculture 10 thousand years ago to the present represents about one third of one percent of human history. This article was published today at the Green Room. It examines the taboo currently suppressing open, public discussion of human overpopulation. It introduces the Global Population Speak Out, a project designed to weaken the taboo. One point I'd like to have made more strongly is that the taboo is especially visible in the failure of major environmental organizations to speak up about overpopulation. They need to be pushed until they do. Otherwise, they have no chance of playing a major role in solving the global ecological crisis. In conjunction with the the GPSO the weekly community newspaper of the state capitol of Montpelier, Vermont has proposed doing an eight page supplement on population. I think this will be pretty ground breaking. How many newspapers in the country have devoted a supplement to population? The only problem is Vermonters for a Sustainable Population, of which I am the president, needs to come up with $3,000 to help pay for the xtra costs. Unfortunately we have no major donors cpable of this kind of financial support in our thrity member organization. If anyone knows of a potential source I would really appreciate your ideas. That would be a first wouldn't it? So if you know any source to help with funding please let me know and I'll forward your message to George, or go here to contact George directly. Good news! I’m pleased to follow this post with confirmation that, as a part of GPSO, The Bridge, the weekly community newspaper of Montpelier Vermont referred to above, will host a forum on population in the third week of February. They will then devote their March 19 issue to the same topic. This is great news. Just as publications sometimes devote extra resources to important issues such as climate change, they need to do so with regard to population. After all, it is in many ways the central environmental issue. Perhaps before long the the largest newspapers will follow The Bridge’s lead. Here's the supplement in the Bridge. At a time when some developed nations are paying citizens to bolster flagging birth-rates (Science, 30 June 2006, p. 1894), a grass-roots group of scientists and environmentalists is calling for a new push to limit human numbers. Overpopulation is threatening life as we know it on the planet, say members of a movement called Global Population Speak Out (http://gpso.wordpress.com/), which aims to persuade at least 50 “respected voices” to “speak out in some way” about the problem for a month next year. GPSO is bringing scientific voices worldwide to bear on the population issue. It's great to have the opportunity to alert a large portion of the scientific community to what we're doing.